Putting up projects in Ravelry is educational. I learned that I like to knit with strong colours and that I prefer small projects. Another interesting things is how much I've knit in which year. Thanks to the blog I have a better record of what I've made than my memory. In 2004 I had lots of projects going and finished, participated in swaps and have blogged a lot. In 2005 there were far fewer projects and none after the move to Ireland, blogging was sparse. In 2006 I began exactly 3(!!) knitting projects and finished one, blogged about one that was ripped eventually. That year I sewed a new SCA wardrobe instead of knitting. This year, I've begun and finished a moderate amount of projects, whether I'll finish them all, remains to be seen. I've found my blogging mojo again as well. Mao has been "helping" me to take pictures of my yarn for Ravelry stash. 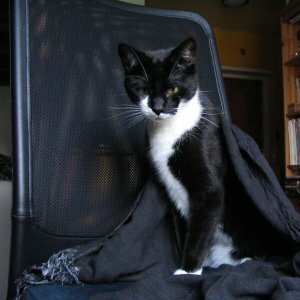 He thinks that the shawl I use for background is for his amusement only. Tomorrow I will go to Wisby Medieval Week. I'm exited (I seem to be exited a lot lately :) ) about it, I've never been to Wisby before and I've heard so many tales about it. I've been told it's a lot like Tallinn Old Town. We'll fly back on Monday and I've got the rest of the week off. Yay, vacation!